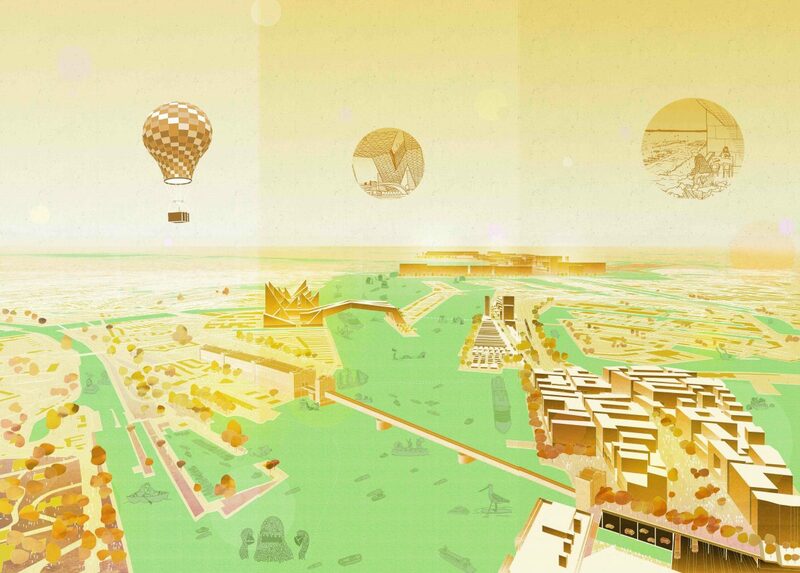 In collaboration with ARCAM, FABRICations participated in envisioning how the city would have changed if five crucial unbuilt projects around the Ij were actually implemented. 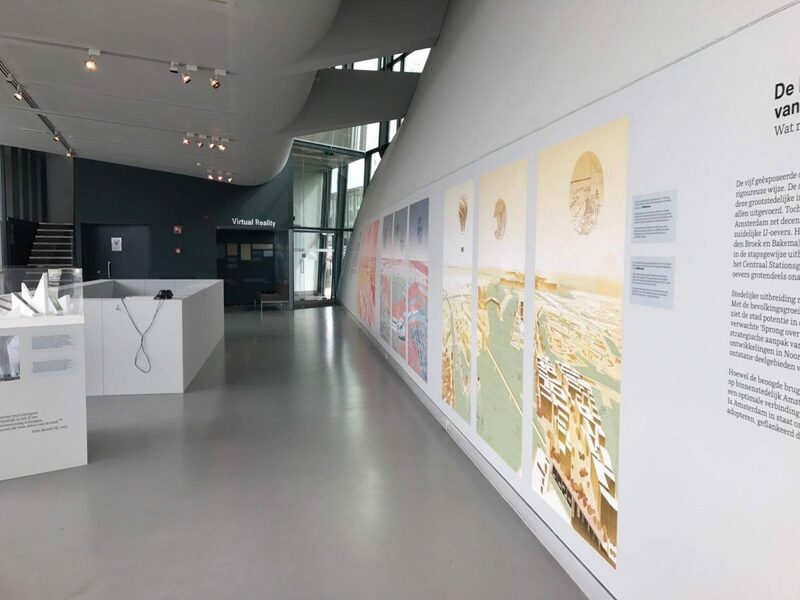 As a contribution to the “Dreaming of the IJ – Five visions of the past” exhibition, we produced drawings that would materialize the spatial and cultural impact of these projects. Three provocative views were chosen to depict the current urban fabric of Amsterdam with the addition of the five unrealized projects along the Ij River from different architects, periods of history, ambitions and desired performances. 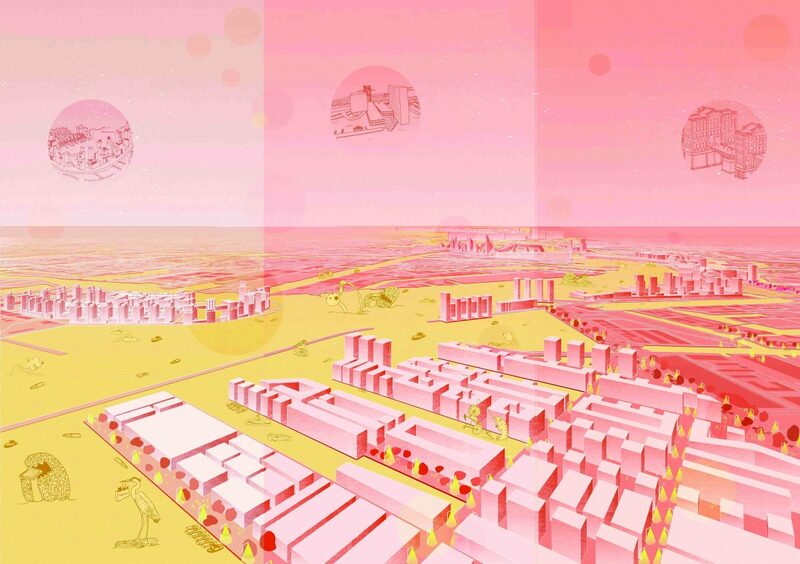 Projects include a bridge design by Jan Galman, City on Pampus by Van de Broek and Bakema, the Southern IJ banks by OMA, Koningsdok by Marge Architecten, and The Floating Games 2028 by Oeverzaaijer. 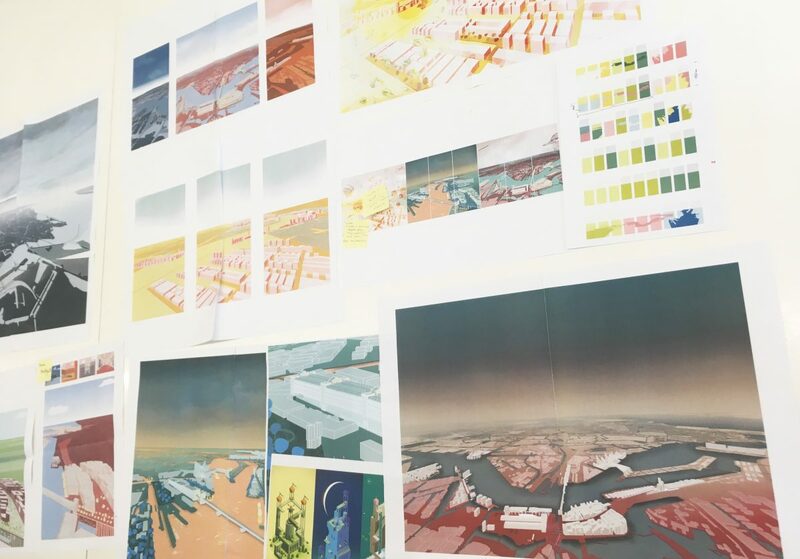 Colours, textures, and gradients have been meticulously tested and combined to project an optimistic future for Amsterdam. 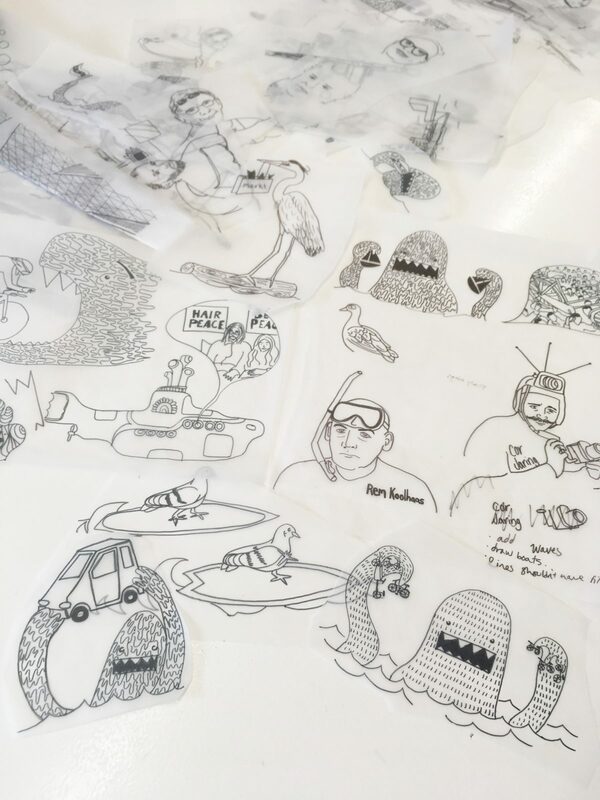 As you look closer at the waters of the IJ River, you will begin to notice a secondary layer to the drawing; a variety of hand drawn boats, characters, local animals, figures and ‘IJ monsters’ serve to enhance the stories of the five unbuilt projects. The drawings highlight the fact that projects on the South side of the Ij operate on a vastly different scale than the projects to the North. 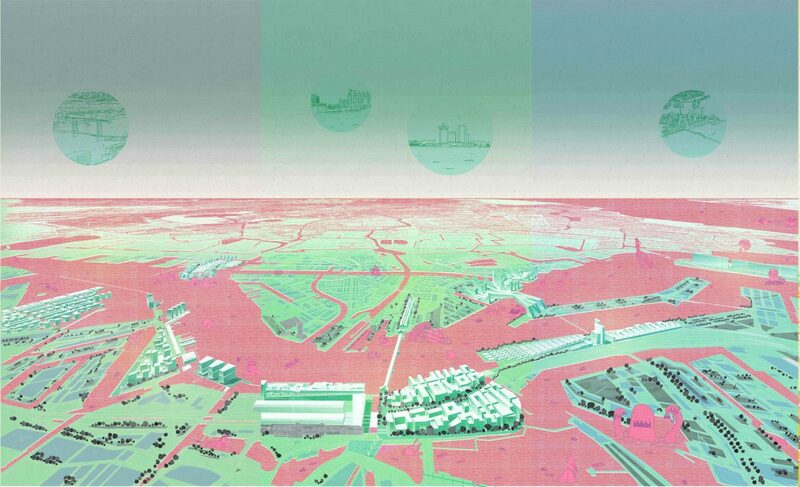 There has been much focus on developing and connecting the South side of the Ij through larger urban designs, such as in OMA’s proposal. On the contrary, the plans anchored to the North side present themselves as independent buildings or urban interventions (i.e. Koningsdok). This peculiar outcome stems from the decision of the City of Amsterdam to stop making large-scale, comprehensive plans. We consider this as a missed opportunity to create value and investment towards a more dense, sustainable and healthy city. We believe that studying these five proposals will reveal bold design ideas of the past that can be implemented in the future. The nine drawings are presented in an exhibition setting at the Architectuur centrum of Amsterdam till the 29th of October , 2017.